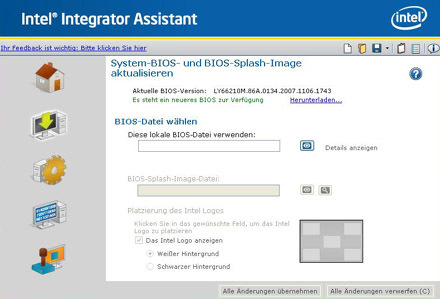 Intel provides with Intel Integrator Assistant (IIA) a piece of software, which makes it possible to manage BIOS Updates, BIOS settings, a asset management and brandings of the system. So it will be even possible to update or adjust the BIOS for those, who had a real struggle with the BIOS till yet. All necessary functions and preferences are listed well structured and are documented by balloon tips. Supported are eg. Intel D201GLY, D201GLY2(A), D945GCLF and D945GCLF2. The home screen welcomes the user with a tidy area, which provides necessary system informations like the Board-ID and BIOS-ID as well as the main menu. In the main menu there are hiding among others the settings, which are normally taken in BIOS as well as the possibility to flash the BIOS memory to an other version. 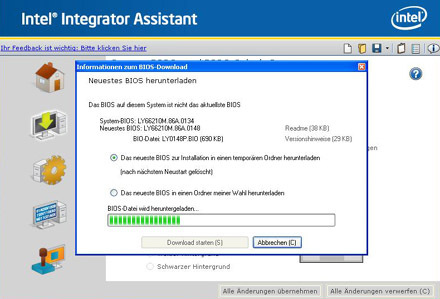 It´s nice that the program checks by internet, if there is an actual BIOS version available and shows it in the main menu with a link to download it. You will be asked if the actual version should be downloaded temporary and be deleted after the restart. Alternatively you can save the file in a freely chosen folder for later use. 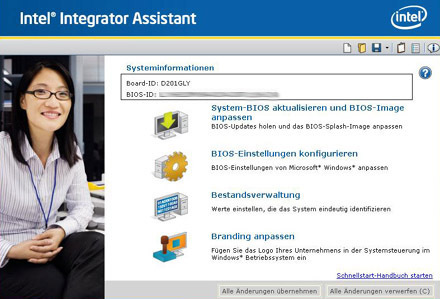 The interface gives the possibility to manage several work stations. You are able to create different profiles and load them as needed. To get IIA to work, Microsoft’s .NET Framework 2.0 or higher is required. 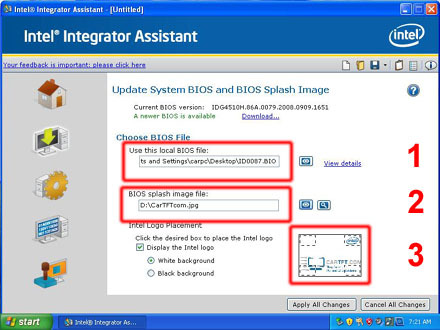 At point 1 of the upper picture you choose a BIOS file or download it directly from Intel. At point 2 you can choose a start logo which welcomes you at start-up of the system in future. The maximum size of the picture is 1024x768 pixels and can be used as JPG or BMP. 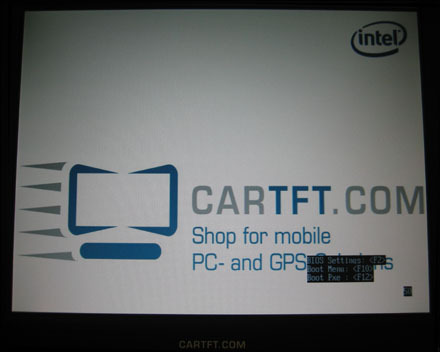 At point 3 finally you can place the Intel Logo. As selection there are the four corners of the screen. Boot process, where boot devices can be activated or deactivated and the boot order can be set. Device management, integrated hardware and interfaces can be activated or deactivated. Energy supply with the most important settings for breakdown, SpeedStep technology (if available), Quick Resume technology (if available) and Suspend Mode (if available). Customize branding: You can add a logo at the system control panel in the Windows Operating System. Many PC users still not dare to enter the BIOS ambience because there are too many preferences which are not known. Further the menus have inexpressive abbreviations. 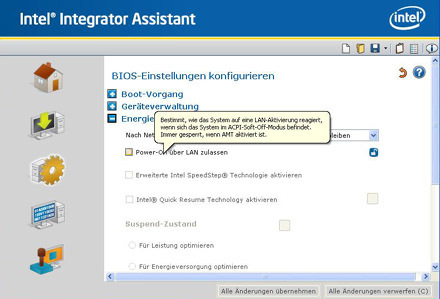 Intel tries to help with the Intel Integrator Assistant to simplify those BIOS settings. For all who do not work gladly with the BIOS and avoided updates, this tool is a very nice feature.